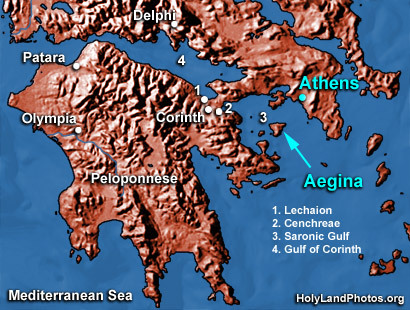 The island of Aegina (Aigina) is located in center of the Saronic Gulf about 18.5 mi. [30 km.] west of Piraeus — the port of Athens. Its name is also spelled as Eyine, Egina, Aigina, etc. The island is 33 sq. mi. [83 sq. km.] in size and depends upon wells for water. It was inhabited as early as the 4th millennium B.C. From the seventh through the fifth centuries B.C. its potters, sculptors, and bronze workers were very famous. During the seventh century B.C. it introduced a system of silver coins which were used all over the Greek controlled Aegean. The famous coins bore the image of a tortoise. The fleet from Aegina was instrumental in assisting the Athenians defeat the Persians at the important Battle of Salamis in 480 B.C. Soon after, the Athenians turned on the people of Aegina, and the island has been conquered and resettled many times since the classical period. From A.D. 1826–28 Aegina served as the temporary capital during the Greek war of independence. The harbor and the Temple of Aphaia are the most important remains on Aegina.